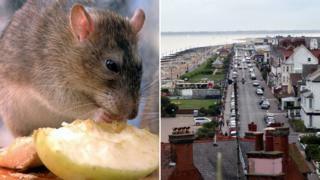 Rats will be gassed at a seaside resort after they were spotted "blatantly running across in front of everybody". Seafront fish bar owner Kevin Barrett said it was the worst year he had known for the vermin. Pest control company Suffolk Coastal Norse said it would begin gassing the animals after they ignored traps. Mr Barrett, from the Regal Fish Bar and Restaurant, said: "You might see one in a season, but this year they're blatantly running across in front of everybody, even people with terriers - they don't seem to be scared." He added he had seen a family sitting on a bench eating with a rat "scurrying around" just behind them, and also watched a seagull kill a rat. Suffolk Coastal Norse, which is responsible for controlling the town's vermin, has cleared vegetation on Sea Road to reduce hiding and nest places. Operations manager Steve Green said it also had staff litter-picking and emptying bins two or three times a day, and had laid traps. He said: "Unfortunately, [the rats] are not interested in poisons or traps when there is an abundance of other food available, so the next option is to gas the rats in their burrows." A council spokesman appealed for visitors to "respect our resort". He said: "An unfortunate side effect of Felixstowe's booming tourist economy is that we have seen an upsurge in the amount of litter. "One of the particular problems is people eating takeaway food, then discarding the remains and wrappers on the ground, which attract rats and other vermin." Is it time to stop hating the rat?